I know I missed Cinco de Mayo and didn’t post this recipe in time, but Chicken Fajitas all great all the time. 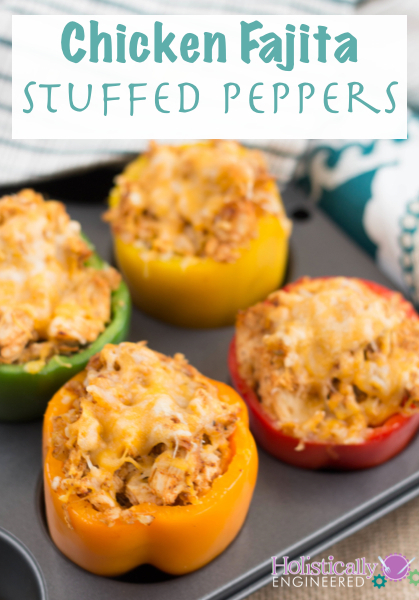 These stuffed peppers have all of the flavors of chicken fajitas with none of the grains. I used my Homemade Fajita Seasoning which is easy to throw together and much better quality (i.e. no fillers or added sugar) than store bought seasoning. The muffin tin trick makes a great holder for cooking stuffed peppers no what you decide to fill them with. Also, if the weather is already too warm where you are to turn on the oven you can always cook these peppers in a cast iron pan on your grill. Trim the tops off the bell peppers and remove the seeds. 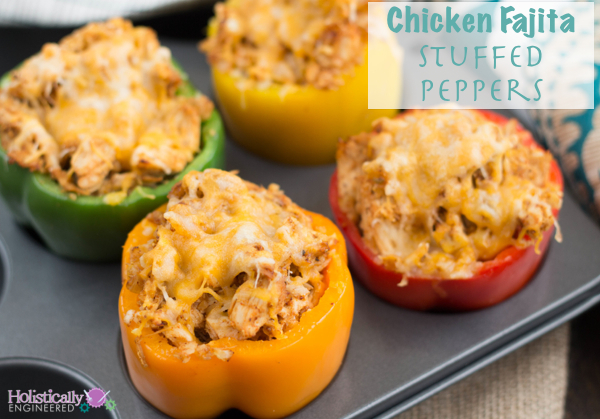 Place the bell peppers into the cavity of a muffin tin (regular or jumbo depending on the size of your peppers). And place the muffin tin pan on a baking sheet. Heat ghee or cooking oil of choice In a large skillet over medium heat. Add the onions and cook for 2-3 minutes. Next, add the cauliflower rice and cook for another 2-3 minutes. Add the chicken, seasoning, and water then stir to combine. Cook for an additional minute. Place the peppers in the oven and bake for 25-30 minutes. « Could Leaky Gut be Affecting Your Health?